Your favorite blend of Cabernet Sauv., Merlot, Syrah, and Zinfandel is back! This wine brings together the best of four wines for a hearty blend with a full mouth-feel. Long legs, jammy berries, and a peppery finish make this wine great with steak and pasta. This white blend of 50% Pinot Gris and 50% Gewurztraminer combines the best of both worlds: a beautiful floral bouquet from the Gewurz paired with the fruity, crisp Pinot Gris. Satin is sure to pair well with melon, fish, chicken, and thai. Stop two on the tour was another great one. Quenett has a very deep selection of wines and I found myself like almost everything they had. The winemaker was really nice as well and we’re looking forward to having him pour for us in the future. A great, everyday white wine with a medium body, slight notes of butterscotch and green apple, with a subtle finish. Fermented in cooler than normal temperatures with nice hang time on the vines, this brings out a medium bodied wine that’s great for summer, or by a warm fireplace. Melon, apple, & pear run throughout this wine. Naked Gris is our chillin’ wine. Smooth, ripe and a bit silky, this wine delivers a full frontal blast of sun country nose that explodes midpalate. Stripping the skins down to the bare essentials, it’s hard to take your eyes off those luscious legs as they streak down the glass. Sip into something a little more Naked… wouldn’t you A-Gris? This is a delicious way to warm to an evening. Who doesn’t like Foreplay, ladies? A large portion of the blend was barrel fermented with full malolactic fermentation which yielded a soft butterscotch finish. Notes like pear and melon are accented by some caramel and toasted coconut aromas from the barrels. Foreplay teases your senses upfront with a bouquet of luscious ripe fruit. No hurry here… once uncorked, let it breathe and work into a nice rhythm as it warms up. Anticipate the sweetness at the end, complimenting the silky tannins. A little Foreplay goes a long way. Our Rose is light and fruity with a hint of sweetness. Even if you haven’t been feeling Gay, this wine could make you change your mind! This is our bare-all wine. Who doesn’t love to get Naked? 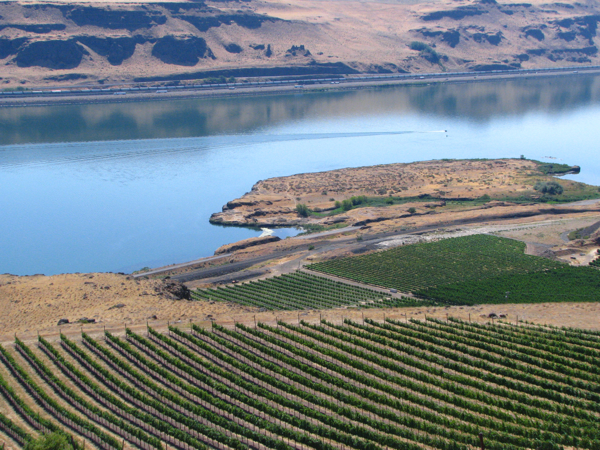 Try the Varietal that made Oregon wines famous: Pinot Noir. 100% Pinot Noir, enjoy the classic light body and floral bouquet with a delicate satin tannin finish. Naked is our bare-all wine. Stripped of traditional attitudes, only the free-spirited grapes go into this voluptuous wine. Lusty with a smooth complexion and long legs. This wine gives a full-frontal of ripe cherries with a firm well-rounded end. Who doesn’t love to get Naked? Although I didn’t get to all the wineries I wanted to, this was a perfect way to start the trip. Day 1 was filled with tasting rooms in the downtown area of Hood River. Day 2 is a trip to the actual vineyards and the valley. To be continued! Glad to see you enjoyed your Naked experience. Great bottle choices and we hope to see you in the gorge soon. !